For the bones you want a combination of bones and meat. 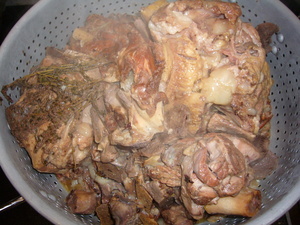 I like to use some veal shank, veal neck bones, veal breast, and whatever other bones I can pick up from time to time. The more connective tissue the better. I usually grab what I see and save it for the next batch of stock. For reference, I paid $1.89 for veal neck bones, and $5.69 for veal shank. Rinse in cold water. 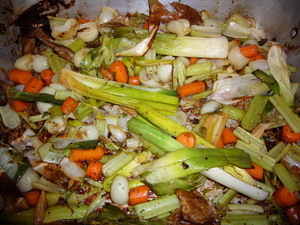 Add the veggies (mirpoix) to the roasting pan with the veal fat. Place back in the oven and roast till they too start to caramelize, stirring from time to time. If the bones are still giving off scum and water temp is still raising, set veggies aside in a separate bowl. 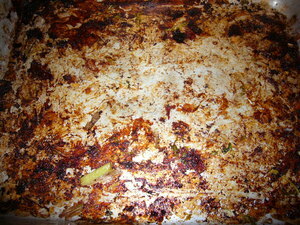 You should have a lot of brown fond in the bottom of the roasting pan. Add the wine, and return to the oven. Every couple minutes, open the door and use a wooden spoon to scrape the brown fond into the wine. Continue till the wine is somewhat reduced and most of the fond has dissolved into the wine, and is scrapped up from the pan. Add wine mixture to the veggies. 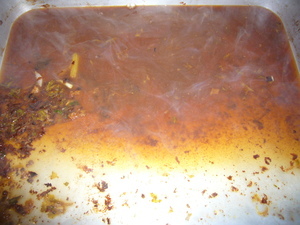 When you're done skimming the stock, add the veggie mixture and the herbs. Allow to simmer for about 12 hours. Strain. I strain through a coarse colander to remove the bones and veggies, and then a very fine sieve (actually a fiber filter used for cleaning fryer oil) to remove the floating solids. 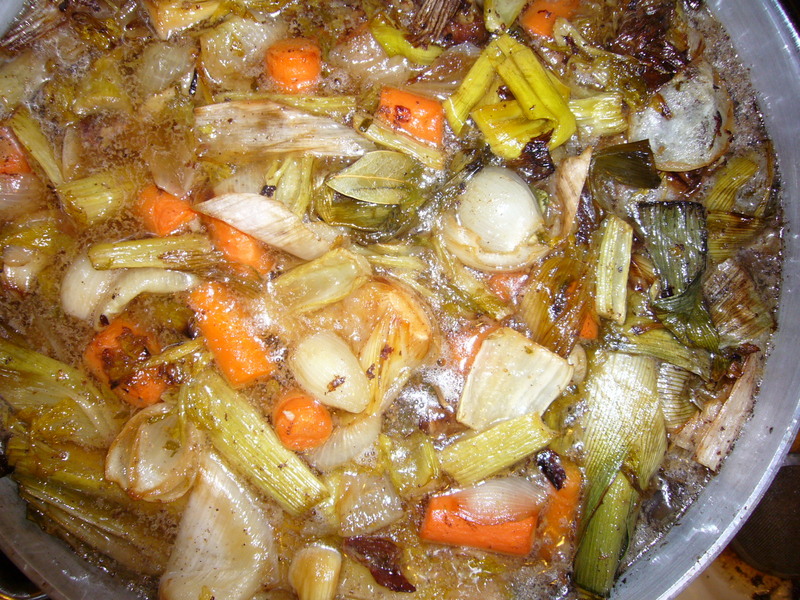 Chill to harden fat which will collect on top of the stock. Remove and discard the congealed fat. Package the stock and freeze (I use my vacuum sealer to make 1 or 2 cup packages for adding to sauces.